Inter City Railways, a joint venture of Stagecoach Transport Holdings Ltd and Virgin Holdings Ltd, has been awarded the deal to run the next East Coast franchise that starts on March 1 2015. Over the next eight years, Inter City Railways will pay the Government around £3.3 billion to operate the franchise. The company will shortly begin talks with Network Rail and the Office of Rail Regulation to agree its plans to run new direct services from London to Sunderland, Middlesbrough and Huddersfield. It will also seek approval to run more trains to Edinburgh, Leeds, Lincoln, Shipley, Stirling, Harrogate and Bradford. From 2018, Inter City Railways will take delivery of the new Intercity Express Programme trains, to be assembled at Hitachi’s factory in Newton Aycliffe. By 2020 all of the 65 modern high-speed electric trains will be in service and will replace 39 existing trains. Inter City Railways has also given a commitment to reduce all long-distance Standard anytime fares by 10%. 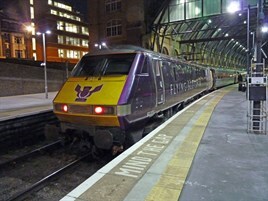 The new deal includes: 23 new services from London to key destinations; plans for new direct links to Huddersfield, Sunderland, Middlesbrough, Dewsbury and Thornaby; proposals for more trains to London from Bradford, Edinburgh, Harrogate, Leeds, Lincoln, Newcastle, Shipley, Stirling, and York; 3,100 extra seats for the morning peak time by 2020 (across the entire train fleet there will be 12,200 additional seats - a 50% increase); 65 Intercity Express Programme trains brought into passenger service from 2018, totalling 500 new carriages; journey times from London to Leeds reduced by 14 minutes, and from London to Edinburgh by 13 minutes; and a £140 million investment package to improve trains and stations. Over the franchise, the extra benefits for passengers will include: complete refurbishment of the existing train fleet; better WiFi connections and onboard catering on the new IEP fleet; improved ticket offices and 170 new ticket vending machines; more than 500 new car parking spaces; 411 additional cycle spaces and new secure cycle facilities; a customer and community improvement fund; and a training fund for new apprenticeships, internships and staff development. Following the announcement, and in accordance with usual procurement practice, there will be a standstill period of ten days before the Department for Transport will be in a position to enter into, and complete, the formal contractual documentation and make the award to Inter City Railways.